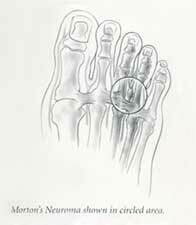 Morton’s neuroma is one cause of metatarsalgia, which is pain in the ball of the foot. In 1876, Thomas Morton described the neuroma: It is due to inflammation of a nerve in the foot. The inflammation is caused by entrapment of the nerve underneath the bones of the ball of the foot. ‘Neuroma” means nerve tumour. Tumour in this case means simply enlargement of the nerve, not malignancy or cancer. The cause of nerve enlargement is repeated injury. The nerve becomes trapped between the metatarsal heads when standing and walking. It usually occurs between the second and third, or third and fourth toes. 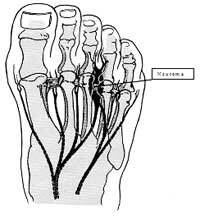 The symptoms of Morton’s neuroma are pain and numbness in the toes. At times, the pain may be absent and at other times severe enough to cause the individual to stop and take off the shoe. It may feel like a marble moving around under the ball of the foot, and sometimes causes a ‘snap’. The examining Doctor can sometimes feel this by pressing on the foot. Testing may reveal numbness in the toes. Diagnosis may be difficult, especially at first. Several examinations may be necessary. The condition tends to get worse with time. With repeated injury, the nerve becomes larger; as it becomes larger, it is more easily injured. Treatment is first to modify the shoes. A pad in the shoe, and an extra wide, soft shoe will help. A cortisone injection a round the nerve may help localise the problem. Surgery to remove the neuroma can be done when necessary. It is successful in 80 percent of cases. Since the nerve is removed, there is permanent numbness in the toes afterwards. This is not usually a problem and it becomes less with time. Persisting pain may be due to irritation at the cut end of the nerve: – a stump neuroma. This can require the surgery to be repeated. Infection is another possible complication. The foot is prone to post-operative swelling and bleeding and this can lead to infection. An adequate period of rest and elevation after surgery is needed to prevent this complication.